If you have ever said you were going to do something and didn’t do it, welcome aboard. If you have always done what you said you were going to do, the Smithsonian needs to speak with you. As much as we mean well, we simply don’t do some of the things we say we’re going to do. I’m not the best sales guy in the world, but part of my job as an executive producer is sales. No wait, all of my job is sales. I sell ideas, I sell people’s attributes, and I even sell potential clients and partners on joining our ventures. But I’m not good at SELLING so I don’t do as much as I should. As we all watched the train wreck of syntax blunders and mispronounced words last night, the endless stream of unanswered questions and badly rehearsed sound bites, does it scare you that Sarah Palin could be a heartbeat away from the Vice President’s office? I know I will never operate on a brain or deliver a speech to the graduating class at NASA but to think that someone that dangerously unqualified could be the #2 person in the U.S. is downright frightening. I know the VP is not #2 with everything but check the history books on how many VPs became President during their term. Johnny Mac is 72. I’ll let “gonna” slide but there is simply too much wrong with that passage to think it was uttered by someone who wants an office down the hall from the Prez. Then again she’s “only been at this for five weeks”. 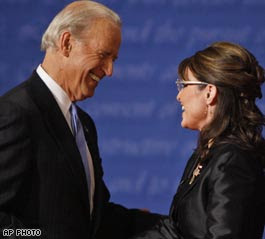 Others brighter than me can pontificate and blog about Palin’s countless O’Biden guffaws last night. I’ll get back to the phones.